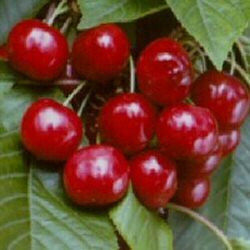 Buy cherry tree Prunus avium Celeste for sale online from UK specialist suppliers of garden cherry fruit trees. Our Celeste Cherry is a large, dark red cherry of excellent eating quality. Ideally suited for growing on patios because of its compact growth form. In plain, non-gardening secret handshake lingo, this means it is smaller than many other of its cherry friends. An added bonus is that it is self-fertile and so does not require another cherry tree nearby to pollinate the blossoms to get cherries from it. Compared to its cherry friends, the Celeste is less likely to contract typical cherry tree coughs and colds. Even though our Celeste cherry tree is self fertile, yields maybe increased by planting another cherry tree of a different species close by. The Celeste is a little like a teenager on Sunday morning and slow to start bearing fruit. The smaller the rootstock you buy and the warmer and sunnier the spot you give it, the sooner you will have cherries. So if you live in Scotland and your natural flesh tone is blue then you will have a longer wait than your sun tanned counterparts in the South. Another issue of weather is one of frost. If the blossoms are out and it is particularly frosty then this can wipe out your whole years crop. So if you live in a frost pocket, which is usually at the bottom of a valley, then you could have problems. The Celeste cherries are not known for keeping well however pickling, preserving, jamming (fruit type not musical type) etc will keep you in cherries throughout the year. Expect the Celeste white flowers/blossoms/blooms to make an appearance around April to May time with the fruit ripening in July provided the birds and neighbours in Ninja suits don't get at them first. The Celeste has "small stones" which in some Mafia films means something completely different. The Celeste cherry can be compared to some of our more "rotund" TV presenters in that there is a large amount of flesh. Pruning should be minimal and ideally after it has fruited. You are aiming to take out diseased, dead and crossing cherry branches and trying to get as much sunlight and air into the canopy as possible. Hiring Polish workers to stand around your tree with mirrors and compressed air guns will not help! Generally speaking, the Celeste cherry tree is a good pollinator for other cherry trees. If you would like to improve your yield then consider planting the following cherry trees close by, Black Oliver, Bullocks Heart, Hertford, Santina, Sandra Rose, Sonata, Sweetheart, Summer Sun. These are in the exact same flowering period as the Celeste cherry tree so if you have lazy bees, they can take their sweet time moving from one cherry tree to another accidentally pollinating away without a care in the World because both sets of cherry blossom will be open at the same time. If you want a larger choice of pollination partners then you can go for Merla, Smoky Dun, Stella, Skeena, Sunburst, Mumfords, Merton Glory, Merpet, Lapins and Petit Noir. This flower just before and just after the Celeste cherry tree blossom. Plant in well drained and fertile soil in a full sun position. The more sun the better.